The Carl Duisberg Training Center Munich is located in the west near the city center. 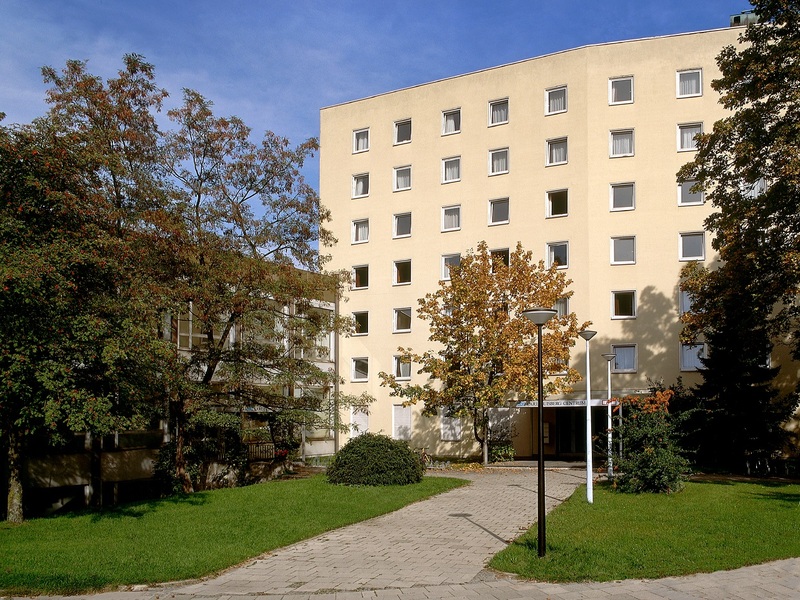 It is close to public transport and to the University of Applied Sciences. Munich University, the Schwabing student district and the English Garden are also nearby. Our training center has 15 seminar rooms, a “Lernstudio” and a party room. We have vending machines for hot and cold drinks as well as a cafeteria serving snacks and drinks in the mornings for our international students. Our training center in Munich is especially convenient, as there is a guesthouse for students on the premises. Munich - a cosmopolitan city and at the same time a village of a million people. This third largest German city is an architectural work of art: the spectrum reaches from the gothic Peters Church at Marienplatz, over the baroque Nymphenburg Palace, to the ultra modern BMW-tower. The metropolis will charm you with its zest for life especially in the way it connects traditional and modern: “laptop and Lederhose” so the saying goes. When thinking of Munich one cannot forget the world famous Oktoberfest, or the FC Bayern München football team and its breathtaking home ground Allianz Arena, not to mention the famous Hofbräuhaus. Top class museums such as the Old and the New Pinakothek, as well as the Pinakothek of Modern Art, the German Museum with the largest natural science and technical exhibitions round off the picture of Munich as the cultural highlight in Germany. The Bavarian state capital is at the same time a strong economic metropolis and important university city, with some of the most internationally renowned and research oriented universities and elite universities. Munich is also popular with students as the city and surroundings have so many high quality leisure activities to offer. Munich is the gateway to the Bavarian Alps for hiking, rock climbing, paragliding, skiing or snowboarding: during every season you can enjoy a whole variety of experiences and sports in Europe’s unique mountainous terrain. Countless lakes and rivers in the Alpine foothills are an open invitation for you to enjoy water sport activities. Famous cultural sites such as the fairy tale castle Neuschwanstein eternalized with the myths of King Ludwig II, are within a 100 kilometer radius. Also important cities such as Augsburg and Regensburg (UNESCO-world heritage site) and the largest stretch of hop growing region in the world, the Hallertau, are situated more or less on the doorstep. After so much activity the best way to end the day is to enjoy a fresh wheat beer in one of the many lovely beer gardens. The minimum age for the Intensive Course 24+6 is 16, in Radolfzell 15. Participants with prior German language skills may begin a German course on any given Monday. The start dates for beginner courses are listed in our price list. Carl Duisberg Centren is a licensed TestDaF Center and offers professional and comprehensive exam preparation courses in Berlin, Cologne, Munich and Radolfzell on Lake Constance. The four-week course is specifically designed to prepare participants for the exam format and requirements. By way of model exams, participants learn a range of strategies and techniques to successfully complete the tasks and master the challenges of the exam. Preparation Course for the Entry Exam at a State-run "Studienkolleg"
The Carl Duisberg Training Center Munich offers an intensive preparation course for the special exam format and the German entry exam requirements at the Studienkolleg Bayern. In this course you will work through various practice exercises and learn strategies and techniques to successfully complete the test assignments. When you book a German Intensive Course (min. 12 weeks) at Carl Duisberg Centren, we help you apply to at least three colleges/universities or a State-run "Studienkolleg". Our professional educational counseling increases your chances for successful admission. We take care of the formalities so that you can focus on your language preparation studies.